PERRY HALL, Md. — The buses are always lined up and ready to go when the school day ends, but parents like Lisa Heilker say it's a different story when her children wait at the bus stop each morning wondering how late their bus will arrive. "Oh, it's been over an hour and on the really, really cold days as well,” said Heilker, “First thing in the morning. Super frustrating." "In the Northeast, we've had an increased number of drivers call outs, and when the call outs happen, we need to make sure that those routes are covered, and so if parents are seeing delays, that's been the main reason for them," said Brandon Oland. 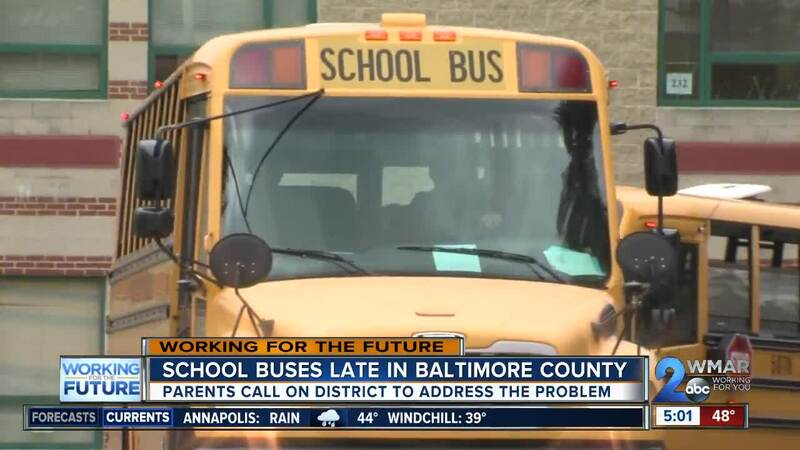 School board members Julie Henn and Rod McMillian, along with Baltimore County Councilman David Marks have demanded an emergency meeting with the district leaders to address buses, which reportedly run as much as two hours behind, forcing some parents to miss work, and it appears the system is trying to find a solution to the tardiness. "In recent weeks, we've continued the process of hiring new bus drivers, training them, making sure they can get out on the road,” said Oland, “We've re-allocated the resources that we already have in the country to make sure these bus routes are getting covered." But all of that takes time, and parents like Lisa Heilker have grown tired of waiting for a solution. "You call. They tell you it's running late and it'll be there,” said Heilker, “You just end up taking your kids to school anyway, because you got places to be." Oland says hiring new drivers with just three months left in the school year is a challenge, and each candidate must be trained, licensed and undergo drug testing and criminal background checks to insure their qualified for the job.